Kristine Kubat and Shawn James-Leavey are meeting with Legislators at the State Capitol to discuss small geothermal and its application to Hawai`i Islands. Kristine Kuba, the former editor of Big Island Weekly, was an outspoken critic of geothermal. Shawn James-Leavey was a writer with the Big Island Weekly and an activist with Big Island Voter Owned Elections advocates. Together they have formed a company which has the rights to the Power Tube [geothermal] Technology in Hawai`i. Kristine Kubat fought against geothermal during the heyday of the anti-geothermal protests on the Big Island. A good introduction to small geothermal would be really small (micro) geothermal. A heat pump is a device which moves heat from one place to another usually using air as the medium. “Geothermal heat pumps are similar to ordinary heat pumps, but use the ground instead of outside air to provide heating, air conditioning and, in most cases, hot water. Because they use the earth's natural heat, they are among the most efficient and comfortable heating and cooling technologies currently available.” Geothermal heat pumps qualify as EnergyStar devices and qualify for federal tax credits. While parts of the U.S. have ranged from 134 degrees (Death Valley) to negative 70 degrees (Montana), the temperature 6 feet below the ground varies from 45-75 degrees. In the winter, caves and igloos are warmer than the land around them, while in summer they are cooler. A working fluid ("refrigerant") transfers the heat from one area to another. The working fluid is a substance which is a high temperature liquid when compressed, and a low temperature gas when it expands. Without external forces, hot substances give off heat to cool substances. 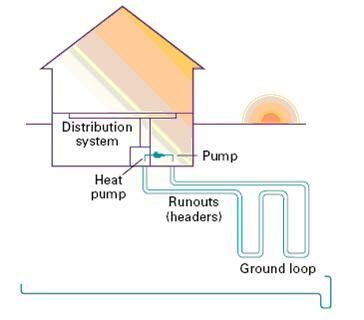 If the ground is warmer than the house, then ground heat goes into the house. If the house is warmer than the ground, then heat goes from the house to the ground. Doyle Brewington has spent the past 18 years developing and patenting a small geothermal power plant. Ten years ago Power Tube Inc. became one of the first to join the Clean Energy Incubator (CEI) which was launched by the Austin Technology Incubator. EV World: "Much of the technology Brewington integrated into the Power Tube is new to the industry. ..."It took quite a while because Power Tube itself has four new technologies and ten different disciplines. Because of that, it took us pretty close to six years to get the patent. ...We don't need to estimate steam or pressure or anything like that. All we need to know is where the heat is. The other difference is the only thing you see on the surface at one of our installations is a ten meter by ten meter building with about a 3 meter roof. " The first prototype Power Tube measures 85 feet in length and is 29 inches in diameter. The working fluid is a mixture of iso-pentane and iso-butane. The unique super-cooling condenser is powered by sound. The input heat must be at least 220 degrees Fahrenheit (104 C). It uses low to medium temperature heat, 110-200 C.
In a traditional geothermal power plant water plays the vital role of a heat conductor. The Power Tube “Argus” is a geomagnetic device that does not need water, steam or steam pressure to operate. The Argus units are designed for the 1, 5 and 10 Megawatt market. The Power Tube uses a monocoque turbo-generator device. Monocoque is a construction technique that supports structural load by using an object's exterior, as opposed to using an internal frame or truss that is then covered with a non-load-bearing skin or coachwork. The word monocoque comes from the Greek for single (mono) and French for shell (coque). The Power Tube has 76 sensors that monitor temperature, speed, pressure, flow and seismic activity and then send the data to a satellite so it can be tracked anywhere in the world. Sounds this could be another piece of the energy puzzle, and then again it could be a bust. The point is the alternative energy solution will not come from a single technology but a mix of technologies. Their will always be the next great invention that will provide more and cleaner energy for the state. At some point we are going to have to jump in the water. We are currently spending hundreds of billions of dollars invading countries for oil and paying too high a price in human lives. Geothermal on the big island seems like it could be one of a number of bridges until the next wave of technologies arrive. Are we going to do something to solve the energy crisis or are going to sit around spewing hot air. Still, an 85 foot rigid PowerTube sunk into the ground in Hawaii may be very vulnerable to seismic forces with very high shear capability. One earthquake could potentially destroy all the value in the equipment because if it is bent or twisted inside its hole it may become impossible to extract or repair. In addition the working fluid could escape into the ground or atmosphere. Solar is better equipped to withstand these kinds of events, especially photovoltaic and solar hot water devices because the installations can be made to float on the movement of the earth's surface. You can't just look at these technologies as a theory. You have to look at how they are likely to perform over time.Because investments in these systems are for 25 years or more, that's a lot of time for things to go wrong. However the micro geothermal which is essentially a heat pump could be good for Hawaii because it can collect the heat in flexible underground tubes. wind and geo-thermal. kinda funny that in fact one of the alternatives is ocean generating power. kinda funny as we are surrounded by ocean! and I hear nothing of development. mind you, all alternatives are expensive, and unpredictable. need people who are not prone to $$$$ as the primary objective. control of water, control of energy, control of farming, control of the "land"....a grand scheme, eh? THanks for raising these points. Kristine here to answer the point raised about vulnerability to earthquakes. Actually the tubes are much longer, with between 140-180 ft in the ground. However, the well is engineered so that the device is not rigid within it but can move with the seismic activity. They are also fully equipped with sensors that monitor these occurrences down to .5 on the Richter Scale. At 6.5 the device shuts down while a back-up system continues to monitor the situation for 72 hours. As for the fluids, a 10MW unit uses only 50 gallons of working fluid (isopentane, isobutane mix), circulating through 1" channels in numerous ropes of stainless steel tubing. Even if the doubled-hulled casing of the heat exchanger breaks open, the fluid is not lost to the environment but remains in the thick-walled tubing. But even if both walls of the exchanger are damaged and somehow each and every tube in the the device cracks open and the fluid leaks out, being highly volatile, it will evaporate as soon as it contacts the hot rock surrounding it. The only other fluid is a biodegradable thermal transfer oil (approved by EPA-approved for use in kitchens) that runs through the thermal riser. How close together can the wells be before one well starts cannibalizing the heat of the other? As in when a community needs more than 10 Mwatts of power.